Get rid of what ails you. Purify your household air. Cleaning products like paints, particle board, plastics, carpeting, paint and even fabrics release chemicals into the air inside of your house. These chemicals may be annoying or even causing your allergies, headaches, asthma, skin rashes and eye infections. Too much moisture and heat can cause mold spores which can cause an entire list of illnesses. 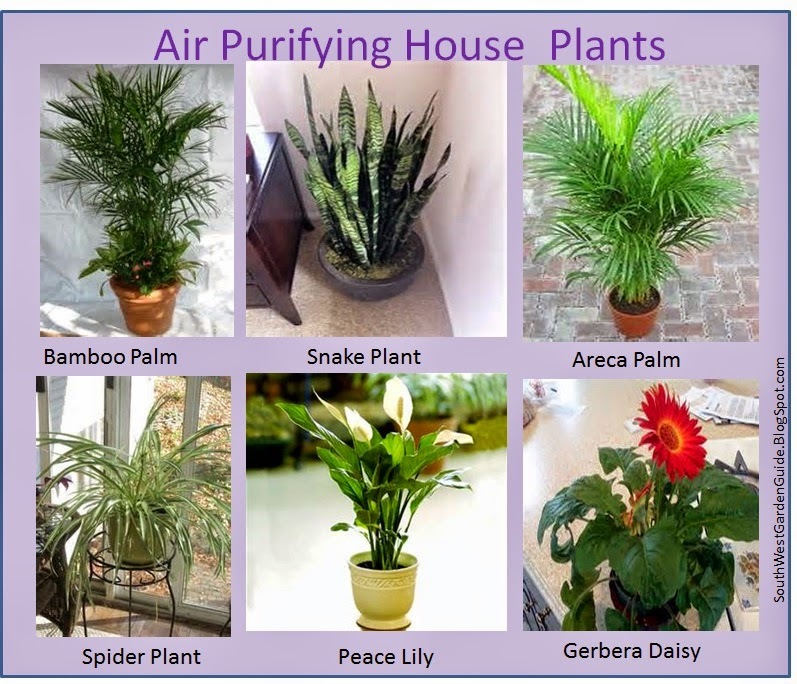 Fortunately there are houseplants such as spider plants (top) and bamboo palm (right), snake plant (left), as well as their soil micro organisms that can help to clean indoor air pollution by breaking down particular harmful gases. 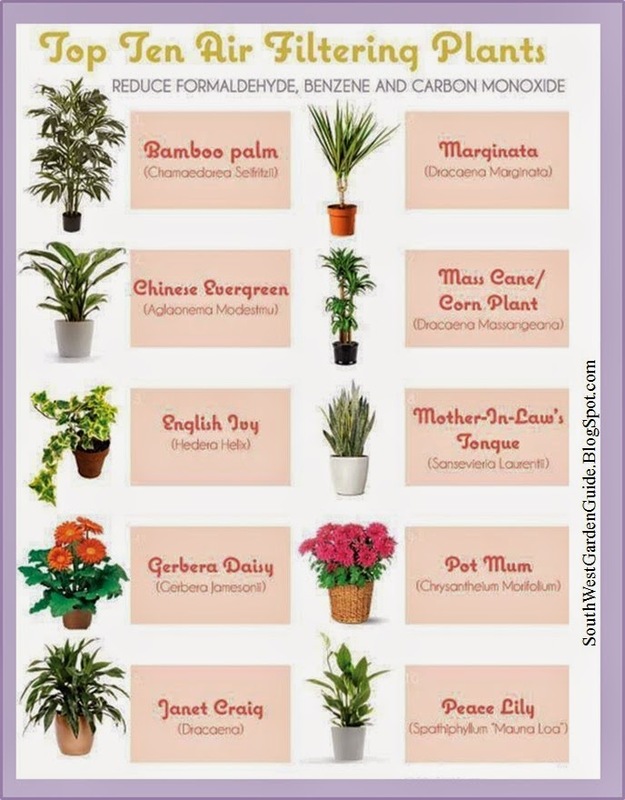 For better air quality in your home, be sure to place at least one of these wonderful houseplants every 100 square feet to clean the air. Each plant should be in a pot that is at least 6 to 8 inches in diameter. Plants and trees breath in our pollutants such as carbon dioxide and carbon monoxide then omit lovely oxygen. No one, including myself ever thinks about the indoor pollution that often makes us sick. The next time you paint, get new carpeting or even new drapes, think about getting a new household companion that will recycle your indoor air that will beautify your space and help you feel much better. 1. Bamboo Palm: According to NASA, it removes formaldehyde and is also said to act as a natural humidifier. 2. Snake Plant: Found by NASA to absorb nitrogen oxides and formaldehyde. 4. Spider Plant: Great indoor plant for removing carbon monoxide and other toxins or impurities. Spider plants are one of three plants NASA deems best at removing formaldehyde from the air. 5. Peace Lily: Peace lilies could be called the “clean-all.” They’re often placed in bathrooms or laundry rooms because they’re known for removing mold spores. Also know to remove formaldehyde and polyethylene. 7. Pot Mum, Chrysanthemum. They're pretty and give off a lovely fragrance but, are also known to purify household air. 9. Dracaena Warneckei is so easy to care for. It's also called a 'Ribbon Plant'. 10. Corn Cane plant doesn't take up much room It grows straight up and it looks cool to decorate as a Christmas tree. Tropical meets Midwest. 11. Janet Craig is a small plant variety and fun to look at. 12. English Ivy is a pretty vine but, can also be evasive. If it grows too long, just snip it and share with your friends. It will continuously grow. 13. Chinese Everygreen is exactly as it states. It always stays green and is most effective in cleaning household air. It's a slow grower but, can be relied on for years. 14. Marginata is a compact palm looking plant. After a year it will begin to grow babies at the base. By looking at this plant you wouldn't think it does much, but it truly does help to purify indoor air. 15. Aloe Vera is my ultimate favorite plant. It grows inside and outside just fine. If you live in snow bound areas where temperatures often freeze, you may consider growing aloe inside only or plant them in a container and bring them indoors. Aloe is medicinal, lovely to look at, will grow babies to share with friends and family. They don't need much water at all. They're a phenomenal plant and make great housewarming gifts. It's important to choose an air purifying houseplant that you're attracted to. You have to live with it and care for it.. it's best that you actually like it. Your air filtering plant will like you back just fine.